Laurent Masurel é um dos melhores “waterman” do mundo, como são conhecidos os fotógrafos de surf especializados em fotografia aquática ou “water-shooting”. Isso significa ficar dentro d’água por horas, enfrentando ondas gigantes, como as da praia de Nazaré em Portugal, para fotografar a poucos metros do surfista, captando toda emoção do momento. Pouquíssimos profissionais conseguem trabalhar nessas condições extremas. Ele nasceu em 1968, em Bayonne, na França, a dois passos da praia. Foi criado na África, onde aprofundou seu amor pelo mar, e voltou para França. Aos 15 anos, comprou sua primeira câmera à prova d’água, uma Nikonos 5. Enquanto se aperfeiçoava na fotografia, disputou muitas competições de bodyboard e chegou a ser quarto lugar no mundial de 1998, disputado na lendária Praia de Pipeline, no Hawaii. Por volta do ano 2000, resolveu juntar o amor pela fotografia com o amor pelo esporte, e tornou fotógrafo de surf. Desde 2006, é o fotógrafo oficial da WSP – World Surf League, na Europa e no Hawaii, onde já acompanhou centenas de provas. Durante os campeonatos, Laurent costuma registrar as manobras radicais dos surfistas sobre as ondas. Mas quando a competição acaba, ele mergulha na criação artística e registra aquilo que as pessoas não estão acostumadas a ver, ou seja, o que acontece abaixo da linha da superfície. São imagens poéticas mostrando o surf por um ponto de vista inusitado e surpreendente. Entre as exposições que já fez estão, “Under Blue Line” e “O Nascimento de Afrodite”. E lançou livros, como “Vagues : Zone d’impact” e “Bodysurf”. Assim como em sua foto “Laisser une Trace”, em português “Deixe seu Rastro”, onde um surfista deixa seu rastro, deslizando a mão pela onda, Laurent Masurel já deixou sua marca no mundo do surf, pela sua técnica, coragem e criatividade. Laurent Masurel is one of the best “watermen” in the world. This is how surf photographers specialized in water-shooting are known. That means staying in the water for hours, facing giant waves, like those of Nazaré beach in Portugal, to shoot a few meters from the surfer, capturing all the excitement of the moment. Very few professionals are able to work in these extreme conditions. He was born in 1968, in Bayonne, France, two steps from the beach. And was raised in Africa, where he developed his love for the sea, and returned to France. At age 15, he bought his first waterproof camera, a Nikonos 5. Laurent started to practice photography at the same time he was taking part in many bodyboarding competitions. In 1998 he was fourth place in the world championship, that happened on the legendary Pipeline Beach in Hawaii. Around the year 2000, he decided to join the love for photography and for sport, and became a surf photographer. Since 2006, he is the official photographer for the WSP – World Surf League, in Europe and Hawaii, and already covered hundreds of events. During the championships, Laurent uses to register the evolution of the surfers on the waves. But when the competition is over, he dives into artistic creation and shoots what people are not used to see, that is what happens below the surface line. 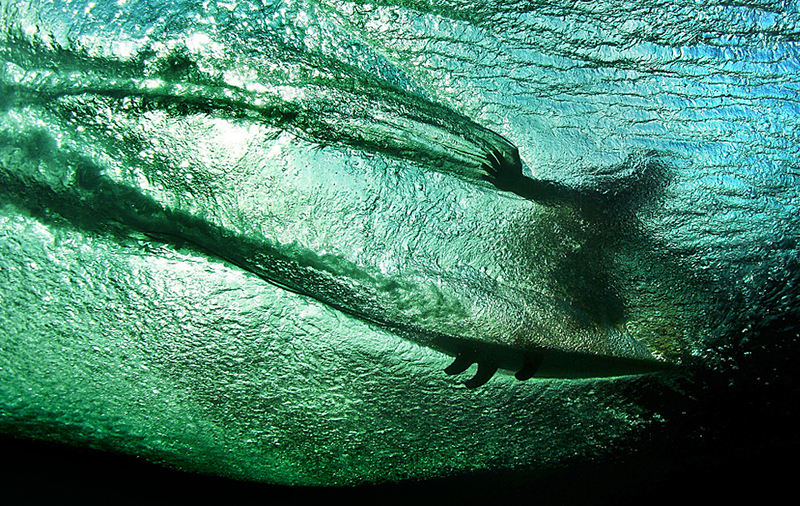 The images are poetic, showing surf by an unexpected point of view. Laurent has done several exhibitions, such as “Under Blue Line” and “The Birth of Aphrodite”. And he released books, as “Vagues: Zone d’impact” and “Bodysurf”. Just as in his photo “Laisser une Trace”, in english “Leave your Trail”, in which a surfer leaves his trail, sliding his hand through the wave, Laurent Masurel has already left his mark in the surf world, for his technique, courage and creativity.